Funny city of Pisa keeps surprising people with its wonderful and extraordinary historical assets. Firstly, the city has successfully maintained the beauty and uniqueness of its monuments, secondly, this destination is a perfect host of spectacular festivals, and third, it gives good energy to every guest present here. 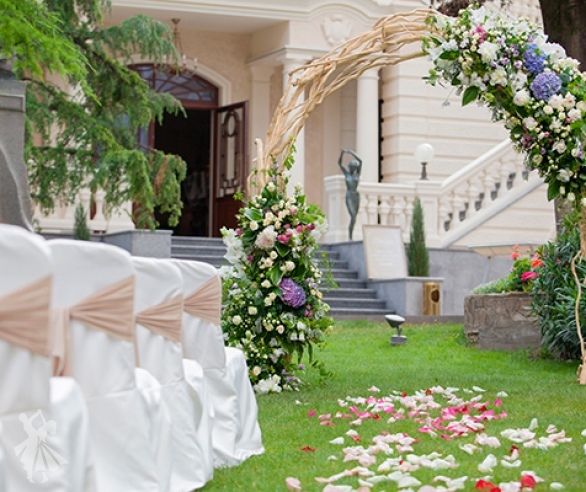 So, it can be a special place for your dream of getting married in Italy comes true. Pisa is situated in the region of Tuscany, in northwest Italy, near the mouth of the River Arno. The city is located at 15 km from the Ligurian Sea, that’s why many tourists after visiting city’s famous locations they immediately go to the beach. Due to its proximity to the sea, it makes it a Mediterranean climate. Celebrating weddings in Pisa would be perfect at any time of year, because here the weather is always warm. In summer, there is a clear and hot weather; despite, people support it quite comfortable, only if they don’t have serious health problems. The weather during this period reaches a temperature of 30 degrees. In winter, there is partly cloudy and foggy weather, precipitation in the form of rain, and very rarely snowfall. The winter daytime temperature rarely drops below 10 degrees. Spring is the best time for the city. There still a few tourists here and the weather is wonderful, of about + 15 + 21 degrees. Gardens and parks get bloom, and birds sing beautiful trills. The early spring rains are not uncommon for this region and period, although rains are over in May. Good weather and lack of visitors’ crowds can barely be met in autumn, when the temperature is still nice and reaches + 24 + 25 degrees. In September and October, the sun shines most of the day, but it can be changed by a heavy rain. In November, the rain falls and cloudy days increase, but the temperature is still nice and doesn’t drop below 15 degrees. Getting to Pisa is possible from Rome by express train, train, bus or car. 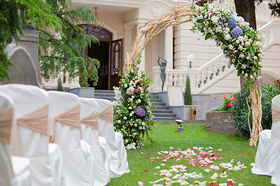 In any case, Italian Wedding agency will find the most convenient form of transport for you and will book tickets or individual transfer in advance, anywhere in Pisa. For more information about how to get to Pisa, please contact the Italian Wedding agency. The Leaning Tower, the symbol of the city is far from being the only miracle. Undoubtedly, everyone who visits this place will certainly make a comic picture on the background of the Leaning Tower. Going upstairs, you will enjoy the interesting sight of "the city in the palm". 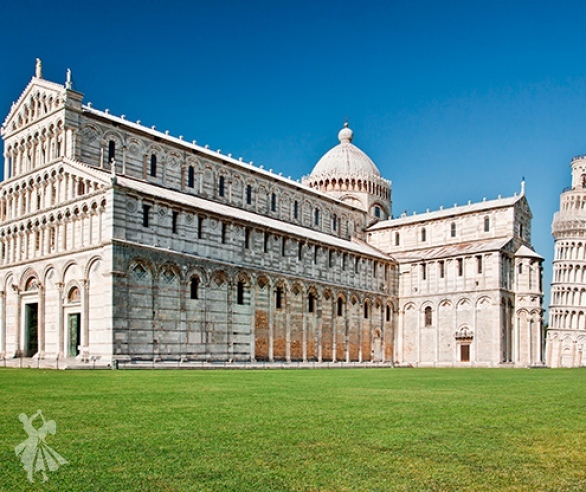 Pisa Cathedral (Italian: Duomo di Pisa) - this is not only a wonderful monument of the city, but of the whole Italy. The beauty execution of its facades, massive bronze doors with reliefs of biblical scenes, as well as the inner splendor, fascinates any mind and heart. Looking at the sculptures, arched compositions, frescoes and arches of the Cathedral, it is hard to believe that all this is the creation of human hands. There is a masterpiece - Cathedra, inside the building, decorated with exquisite stone carvings, by the art master Giovanni Pisano. Pisa Baptistery - another amazing miracle of Italian architecture. The construction of the monument began in 1152 and lasted for about 200 years. The skillfully executed facade of the building, in the form of arches, columns and reliefs, attracts the attention of every city’s guest. 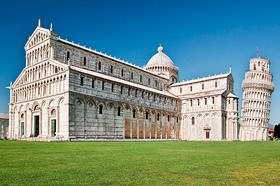 The Holy Field or Monumental Cemetery in Pisa - is the fourth extraordinary monument on the "Square of Miracles." It is a monumental building with lots of arches lined up along the walls of the building. Inside, particularly impressive are the frescoes from the 14th century and Roman sculptures. The main part of the city's population, about 60% are students, who are studying at the university, where Galileo Galilei lectured a few hundred years ago. Thanks to the young generation of bright minds, here are organized spectacular performances. Life in Pisa is full of bright and positive goodwill toward the world, and because of this energy any holiday here it's a miracle.